The fishing village of Rockport, Texas has been a beloved coastal hideaway since the 1800s. Located on the western side of the Gulf of Mexico, it’s nestled 30 miles northeast of Corpus Christi and separated from the Gulf by a thin strip of barrier island. It’s known for its endless recreational possibilities — swimming, fishing, birdwatching, visiting the local wildlife refuges, or just relaxing— and it’s typically mild weather. It’s this serenity that led Chuck and Suzanne Moreau to buy a quaint beach house there as a retreat for their family decades ago. And if you’ve heard of this idyllic beach town for any reason other than it seeming like a little slice of heaven, it’s probably because it sustained a direct hit by Hurricane Harvey in August 2017. With more than 60 inches of rain falling, the highest storm total rainfall amount ever recorded in the United States, the resulting floods inundated hundreds of thousands of homes across Texas and displaced more than 30,000 people. Harvey made landfall in Rockport as a Category 4 storm with 130+ mile per hour winds and a 13 foot storm surge, destroying homes and shutting down virtually all of the town's businesses temporarily. Chuck, president and owner of Brazos Flooring and Design and Premier Countertop Design both in College Station, along with a partner, rushed to the town within days to see what they could do. After nearly two years of helping everyone else, Chuck and his wife Suzanne, a retired dance teacher, finally took on the project of renovating their beach house, which suffered significant damage from Harvey. They were lucky that all they had to do was renovate. The existing structure had been a basic fishing cabin, with just sleeping quarters and a kitchen. But when they started the renovation, they knew they wanted to do something different: they were able to re-configure everything, changing the whole layout of the house. Before it was one big room that opened into a little bedroom and a small bathroom. Now there’s a big kitchen, a big living room, two bathrooms, two bedrooms, and a laundry room. And the entire design of this upgraded and updated space centers, quite literally, on Vetrazzo Floating Blue. 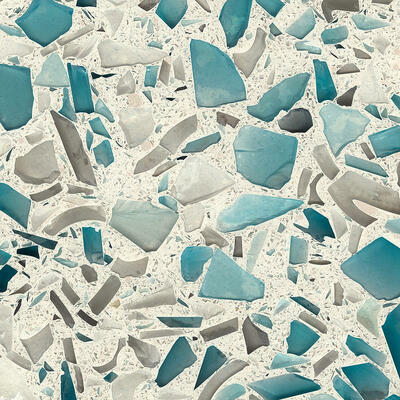 Inspired by sea glass, Floating Blue’s sparkling surface is created from skyscraper float glass and captures the clear turquoise waters of the Caribbean Sea.  The Moreau's Floating Blue island is a part of Vetrazzo's newest product line - The Designer Collection - a bio-resin based surface that is ultra stain resistant making for maintenance-free living for families. Designer Collection slabs are made to order for custom sizes and applications like furniture and flooring and are available in thicknesses ranging from 3 cm to 1 cm. See more here from designer Laura Umansky. Set your mind adrift on the clear turquoise waters of the Caribbean Sea. the sun and clouds from the tallest skyscrapers. Cement based slabs for residential indoor and outdoor usage. Heat and UV resistant. Bio-resin based, made to size pieces, ideal for commercial indoor usage, flooring and high traffic areas. Non-porous and stain resistant. 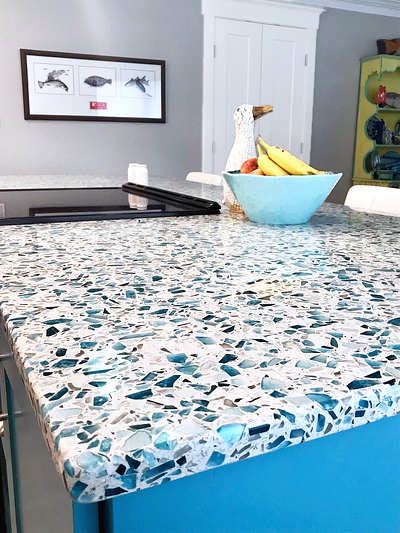 After considering quartz surfaces, the homeowner was literally stopped in her tracks by the look of Vetrazzo's recycled glass surface. Latera Architectural Surfaces supplied the 3 cm material. 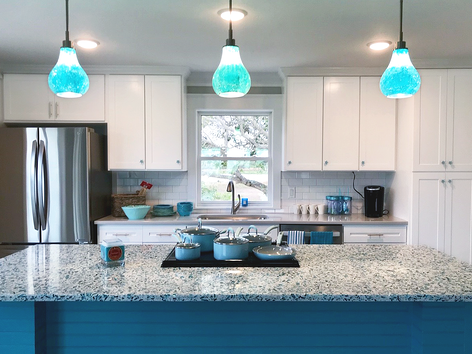 The Moreaus had known they wanted something for the kitchen island countertop that was colorful, unique, and would brighten the space, as the redesign of their beach house was centered around a large kitchen island, perfect for entertaining. They looked at all kinds of different quartz from different companies, but nothing felt right until Suzanne saw the Floating Blue. 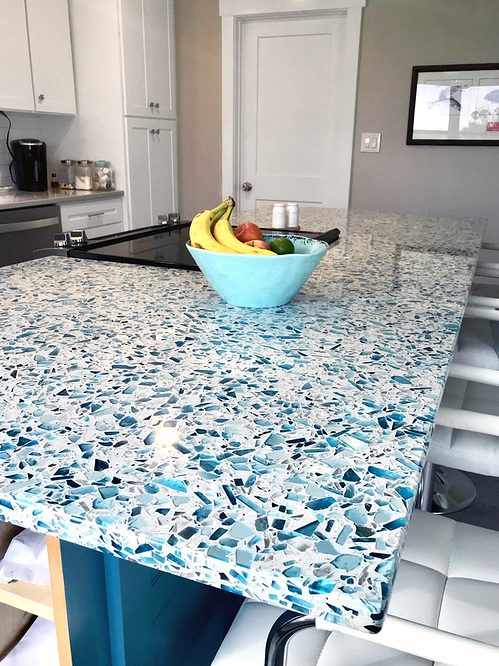 With individual variations of glass placement, these handcrafted American-made slabs are a way to incorporate shades of blue in an impactful way, without it being overwhelming. 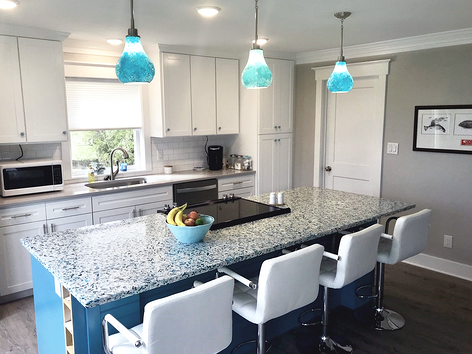 The island itself is painted in a color inspired by the Vetrazzo slab, Sherwin Williams’ Cloudburst, and there are matching blown glass pendant lights by Kichler hanging above it. Completing the kitchen, the refrigerator is by LG and the dishwasher, cooktop, and oven are all by Whirlpool. Latera Architectural Surfaces supplied the material. The color scheme for the rest of the renovated house is inspired by and built around the island countertop, too. The throw pillows on the couch, the comforters in the bedrooms, all of the details that make a house a well-designed home, are all inspired by the colors of Floating Blue. And Suzanne wasn’t the only one awed by these innovative, durable, and beautifully colored slabs. Floating Blue is made from large chunks of architectural glass in a pleasing mixture of sizes to create a dynamic sparkling surface. Even though their Rockport beach house is about a four-hour drive from home, the Moreaus plan on going there at least twice a month through the summer. And it seems as though many others are making sure to get their quality time in Rockport: according to the Rockport-Fulton Chamber of Commerce, 93% of businesses have reopened post-Harvey. Keep that summer look going all year round. Download the inspo gallery.